At left, Desiree herself. Click on the photo for a better look! Many of you have visited here over the past weeks due to my posts about Desiree Horton, the helicopter pilot/reporter who flew into our lives on KTLA. She made an impression on a lot of viewers, not just for her striking good looks, but her calm, even voice and contrasted style (compared to her predecessors) of reporting. The latter probably got her dumped by KTLA, since they seem to be looking for larger-than-life personalities across the board, even to report something as dry as traffic (witness, once again their sweeps event, "The Audition," which looks for yet another weathercaster for the KTLA Prime News). The fact that Desiree not only reported on traffic but also flew the helicopter made her even more special. Her long shifts included getting up at 3:00am and manning the ‘copter into the afternoon each day, with she and her camera person gathering footage for the 10:00pm newscast. While a couple of readers wrote to mention they had met Desiree, the one-and-only herself dropped me a few e-mails over the weekend and was kind enough to answer some questions and send along some photos. Here’s what Desiree had to say. 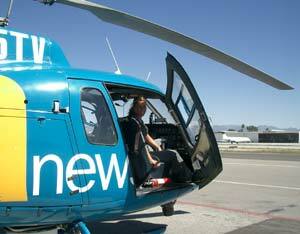 “Just to (correct) any misunderstanding…I do not pilot KTLA's helicopter for the morning show while Willa reports. Someone actually e-mailed the station asking where I had gone and their response was that I was still flying for them, which is not true. “(It) took me a little while to get over being so nervous on TV (I am just a pilot you know) and getting used to doing that job 5 days a week! I do not take offense to the fact that I was not for them. It was a great experience and it taught me to appreciate certain things and realize what I really want to do with my flying career right now, which is fighting fires...much more rewarding than the news industry. As a pilot, I am much more appreciated out on a fire. It's very rewarding. Although I do owe (KTLA) thanks for giving me a try and allowing me to experience such a unique opportunity with that job. At left, Desiree at the "office." Hi Desiree personaly i would like to comend you on acheaving your childhood dream, now i would like you to advise me on how i would acheave mine of flying and what assistance you would give.Thanks and waiting for your reply. hey desiree probably dont remember me but met you in Abeline Tx. I was the military pilot down there while you and your team were doen there fighting fires.. where you guys at these days.. I just watched a DVD about the history of the Van Nuys Airport and saw you in it. I had to "google" search your name and found this. I miss you, too, from Channel 5 news. You were a welcome change from other reporters in the helictopter - I liked your calm, even-toned professional way of doing the traffic news. Good luck to you wherever you are! It's been several months now, but I still can't believe KTLA got rid of pilot/reporter Desiree Horton. Since Horton left KTLA, I've made it a point to observe the work of other Los Angeles TV helicopter pilots and reporters. Now it's harder than ever to understand why KTLA didn't keep her, and why no other station has yet realized what an asset she would be to their news program. Viewers clearly liked her as a search of the Internet for "Desiree Horton" shows. I couldn't agree more with all the above responses. Desiree, you were the only reason I watched KTLA in the mornings. Back to ESPN I go. I will keep checking in to see what you're up to though. I'm another Canadian that tuned in every morning after work just to see Desiree's smile on KTLA and I just found out this morning where she went and it hurt to know I wouldn't see her smiling anymore in the mornings. Desiree all the power to you and your love for flying... just know you are truly missed. I tuned in from Canada to watch that really exotic lady flying the helicopter on KTLA. Very hypnotic eyes and nice smile kept me watching. Not happy that the station decided to go with that other gal. Back to the watching another station via satelite. Lots of luck to you!! too bad ktla had the last say, and not your public,,,you're quality was unique to the job, and fit in well. yeah, you were shy at first, but i waited patiently, sure as everyone else did to see you come into your own, like watchin one of your own grow... will continue to watch ktla, just too bad they couldn't see what the rest of us did. Hey Desiree, just another fan chiming in! I miss seeing you up in the helicopter...nothing like waking up in the morning and seeing a beautiful woman on t.v. FLYING A HELICOPTER! And I cant believe I dropped the ball and missed the Love Ride this year and you there. Strike Two! Hope to see you on t.v. again, or modeling for H-D...(was that you?) Will you be posting any dates if you do appearances? Take care and be safe up there! Desiree, you were the ONLY reason I tuned into KTLA Channel 5 Morning News. Even at that time in the morning my eyes were wide open every time you were on the TV screen. Much success to you. Question for Desiree Horton. Why did Bill Thomas and you swap places? You were on channel 7 and Bill was on channel 5. All of a sudden you two switched. I am like others here, I keep looking for your return and nothing so change to other stations. Desiree, I have been turing onto the KTLA morning news for weeks waiting for your segment and all that there was on is Willa. I emailed them asking what happened to Desiree with no resonse. Now, I finally found out the deal. Wow, sorry to see that. You were the only reason I turned the 5 news on in the morning while getting ready for work. Not anymore I guess. Hope all is going well for you. I will try to keep up on what you are doing and hopefully will be back in front of the camera again. Take care. Great to see Desiree respond. I turned her on to Innocent Bystander when I was communicating with her through email. I wanted her to see how many fans she made in that short stint at Channel 5. If she never returns to TV she will be our Cult Favorite. Great photo of her, glad of that and the other picture of her but sad there aren't more pictures. Fly on Desiree! I will really miss Desiree. She was the best thing that ever happened to KTLA. What a mistake to let her go. At least she can now do what she really was trained for. Very nice post, Gary; I agree with you, Desiree is indeed winsome. Quite lovely, indeed. Thank you, thank you, thank you so much for the post. It was so worth the wait. Desiree is an amazing woman doing extraordinary things. I really admire her. And thank you too for the pictures. She is so beautiful.